Some unions are ready to jump on Trump's "Buy American" bandwagon. In an op-ed last week, Teamsters President James P. Hoffa, Auto Workers (UAW) President Dennis Williams, and Machinists President Robert Martinez, Jr., applauded the president's “Buy American and Hire American” executive order and urged Congress to do more. But do such campaigns really benefit workers? We published a critical perspective from historian Dana Frank recently: "Interview: The Pitfalls of 'Buy American'" (Labor Notes, May 2017). That story sparked some sharp reactions among readers; here are a few samples. To share your take on “Buy American,” write to letters[at]labornotes[dot]org. —Editors. I’m sure I’m not the only UAW member who finds this insulting and insensitive to our members. It writes off the auto workers fighting for jobs as racist Trump supporters. We are fighting for every job we can get. In that fight we do draw lines in the sand. We do fight for and demand that autos should be built here, made from parts produced by UAW members. We fight to support our families by doing what we know well: building vehicles better, safer, and cheaper than they are built elsewhere. We are forced to compete and to fight for our lives by a system that divides us all. This article implies that the “Buy American” campaign was just racist, when European vehicles built by white union workers were equally discouraged. Yes, there are too many racists among us who need to be fought tooth and nail—but most of us are better than that. The murder of Vincent Chin should have been more of an indictment of a drunk racist KKK member than an entire class of Detroit autoworkers. What’s important is international union cooperation. What we don’t need to do is create division by opposing “Buy American” and casting shade on auto workers. Shoot—I have seen H-1B visa applications for welders, pizza makers, plumbers, you name it. Not all those visas are high-tech. “Buy American,” which was trending in the eighties, went hand in hand with “Team Concept.” Proponents in management and in union officialdom told us that labor and management should cooperate and beat the foreign competition. Management and top union brass ganged up on rank and filers who resisted this arrangement. Ultimately, “Buy American” and “Team Concept” did little to stop outsourcing and plant closings. U.S.-based corporations acquired global power, while U.S. labor tailed behind. When labor begins to behave independently of corporate initiatives and globally alongside unions everywhere, then we can move forward. You have to ask, what is the other option? We’ve made Japan and Germany strong due to purchasing their products. At the same time, when they locate here, they bring down our auto industry by paying low wages and using temporary, non-union employees. GM, Ford, and Chrysler have added to our middle class. Japan, Germany, and now Korea sell cars here and prevent U,S.-made vehicles from entering their countries. Their profit goes to the 1%, while everyone else is exploited! Remember “don’t buy where you can’t work”? We need to get back to that! 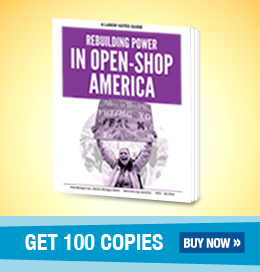 “Buy American” puts no emphasis on workers’ power or solidarity. It’s not a winning strategy. That said, I’m from Janesville and I would never under any circumstances buy a foreign car.